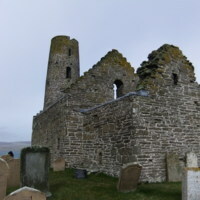 St Magnus Church, founded at the site of the killing of Saint Magnus Erlendsson, Earl of Orkney by an axe-blow to the head in ca. 1116 at the orders of his cousin Hákon Pálsson. This episode, referred to in Orkneyinga saga, is possibly corroborated by a damaged skull found in a hidden cavity in St Magnus Cathedral in the early twentieth century. The church has a distinctive round tower, more typical of Irish churches.